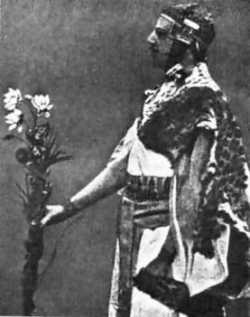 English: en:Samuel Liddell MacGregor Mathers, in Egyptian getup, performs a ritual in the en:Hermetic Order of the Golden Dawn. Picture from before en:1918 scanned from en:Aleister Crowley autobiography. Fuente Transferido desde en.wikipedia a Commons por Telrúnya. Autor The original uploader was Ihcoyc de Wikipedia en inglés. Este fichero se encuentra en dominio público porque the photographer is yet unknown. It is believed that the author died 70 years ago and/or the image was published before 1923.